AUTOCHECK REPORTS ZERO ACCIDENTS, 1 OWNER -- 5.7L HEMI V8, CHROME WHEELS, TOWING PACKAGE, HEATED SEATS, HEATED STEERING WHEEL, BACKUP CAMERA -- FREE CAR WASHES AS LONG AS YOU OWN IT! You can find this 2016 Ram 1500 Big Horn and many others like it at Preferred Auto Fort Wayne State. 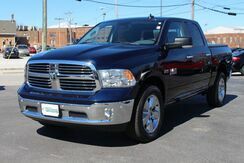 In addition to being well-cared for, this Ram 1500 has very low mileage making it a rare find.